I hope you have lots of festive occasions coming up this month and if so, I have the perfect holiday appetizer to share with you. I use one of my favorite doughs as a base (it’s a brioche dough with eggs and butter and lots of richness) and then fold in Parmesan, fresh thyme and cracked pepper. It already sounds good, doesn’t it? 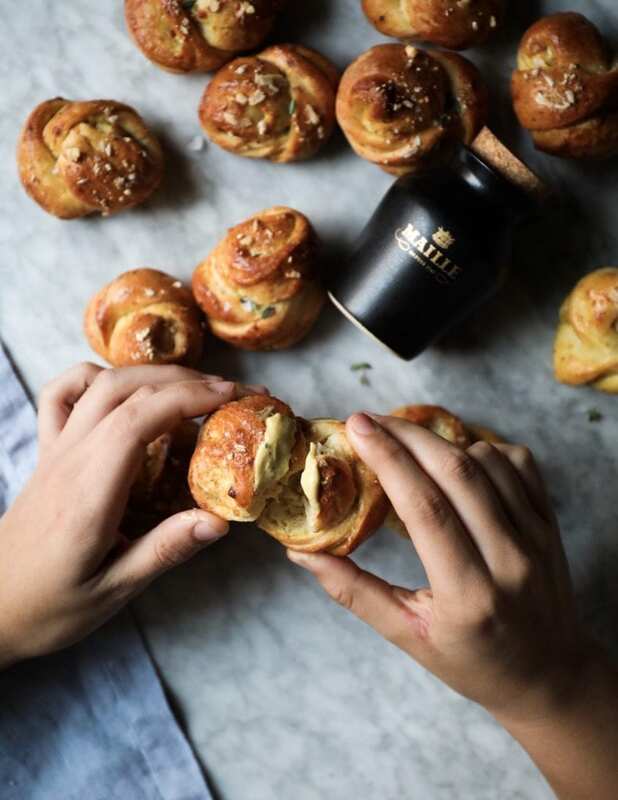 I put a thin smear of Maille’s Black Truffle Mustard With Chablis Wine over the top, knot and twist these babies and then bake until golden and bronzed. These truffle mustard knots are delicious all by themselves (Great as a side to soup? In place of a dinner roll? New Year’s Eve nosh?) or as we’ve been enjoying them with a wee more Black Truffle Mustard (because I can’t get enough of it) or as part of a simple charcuterie board. One of my favorite bits about this dough is that it gets better and improves the longer you let it sit in the fridge. Although I suppose the same could be said for most all yeasty treats? If I have an event on a Friday, this dough can be made on Wednesday and then shoved to the back of the fridge until ready to deal with it. On Friday, a quick rise with the aid of steam + an unheated oven and bam, they’re ready to bake off. I truly prefer these mustard knots fresh-from-the-oven so plan your baking-entertaining schedule accordingly. 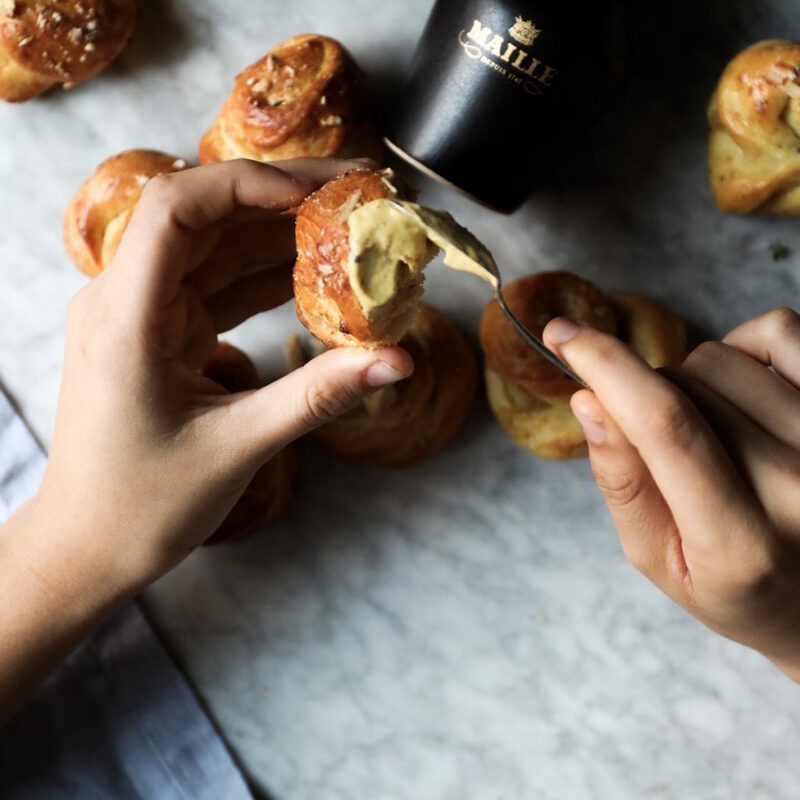 This Maille mustard is so freaking delicious and would make an AMAZING stocking stuffer for the food lovers in your life…I’m just saying! Make Ahead. These are perfect for entertaining because they can be mostly all prepped ahead of time as noted above. When it’s time to knot + bake, just have everything prepped and it will go fast. Rise Time. Make sure you allow enough time for the dough to get its’ proper rise on. You want the dough to double in size before putting them in the fridge and then again after they’ve had their steam rise in the oven. If they don’t properly double at either point, add more time to let them get where they need to be. Humidity. Humidity can be tricky this time of year and low humidity can be a killer to your dough. When it’s dry out I’ll often simmer some water on the stove to get some moisture in the air if I have dough rising on the counter. A damp cloth over the top can also keep things moist. What you don’t want is for your dough to develop dry scabs…this can inhibit the dough from getting its’ proper rise. One last note on this, when putting your dough in the fridge for an extended time, make sure it is wrapped tightly so that it doesn’t develop any dry spots as well. Flexible. You can add in the Parmesan, thyme and cracked pepper or nothing at all. Swap in another cheese, skip the herb…make them yours! Mustard. Whatever you do, you can’t skip the truffle mustard because even the small bit smeared over the top gives mega flavor to these guys. And to that end, don’t think you have to add a ton to get the flavor. It’s actually more messy than anything else if you add more than the recommend amount. To Serve. Definitely serve with more mustard and they don’t need much else. We loved them as appetizers, but they could be so much more. They would work for a more casual, elegant dinner paired with soup (can we make causal-elegant a thing?). Doesn’t that sound cozy? Or as a side to something more formal and sophisticated…these little mustard knots can hold their weight either way. 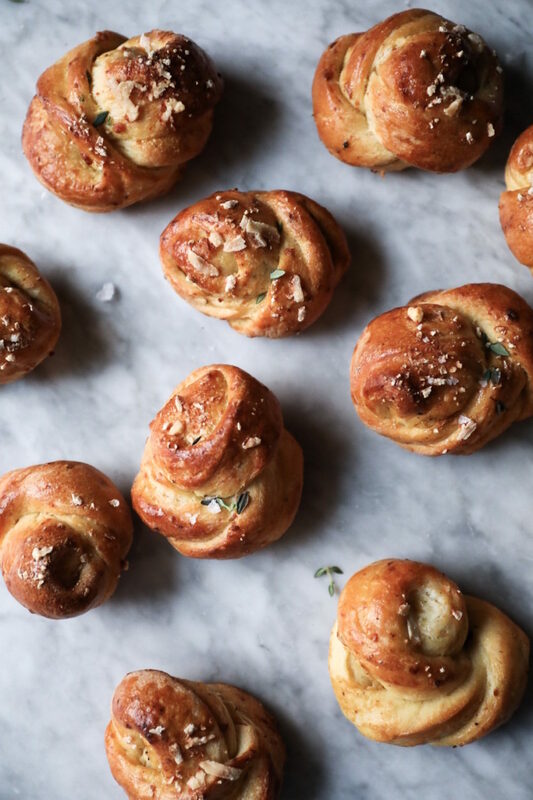 Let’s bake some savory mustard knots, shall we? 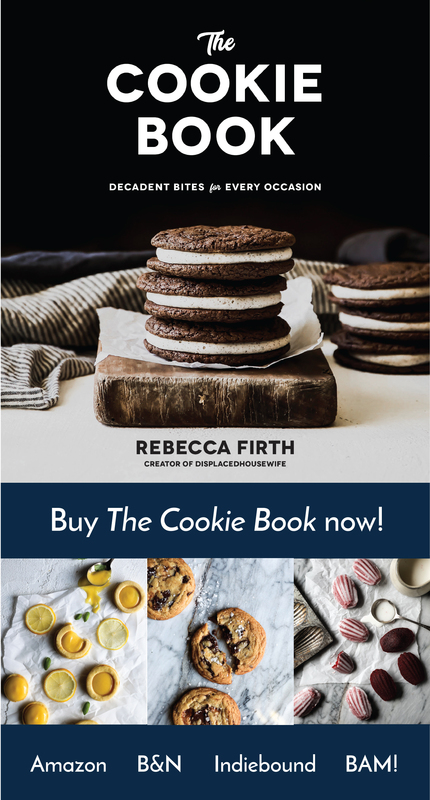 In an electric stand mixer fitted with the dough hook attachment, mix the yeast and buttermilk and let sit for 15 minutes. Add in the flour, melted butter, egg yolks, honey, sea salt and pepper and knead on low until everything is mixed together (you may need to scrape down the sides to get everything incorporated) and then turn the machine up to medium for about 15 minutes or until the dough ball becomes shiny and smooth. Add the parmesan and thyme leaves running the machine 1 minute more. Rub 1 tablespoon of oil around a large bowl. Set the dough inside, turning to coat with the oil. Loosely cover the bowl (use a damp towel if the humidity is low) and let the dough double in size…it should take 1 ½ to 2 hours. Then cover the bowl tightly with plastic wrap and set in the fridge for at least 12 hours and up to several days. When ready to bake, divide the cool dough into two equal-size chunks. Lightly flour a clean surface and roll each piece into a 12 X 9 inch rectangle. Try to make sure the edges are squared off and not rounded. Brush the topside of each dough rectangle with 2-3 tablespoons of Maille Black Truffle Mustard. Now we’re going to cut each dough half into 12 strips. I like to use a pizza cutter, but you could also use a very sharp knife, bench scraper or dental floss (I’ve never had much luck with the latter, but maybe you’ll love it). Each piece should be roughly 1 ½ centimeters wide…but don’t stress out on that too much as these are rustic little knots. Each dough log should yield 12 strips of dough, for a total of 24. Bring a pot of water to a boil. Line several baking sheets with parchment paper. Grab one strip of dough. Holding each end gently twist the dough moving your hands in opposite directions and then we’re going to tie it into a simple knot. Wrap the dough (adding some more twists if you like) around your index and middle finger and then tuck the ends underneath as you slide it off of your fingers. This is A) a bit messy and B) an imperfect process. Go with it. As you shape the knots place them the prepared baking sheet, allowing several inches in between knots for rising. Place an oven-safe skillet on the bottom rack of the oven, put the baking sheets with the buns on the top rack of the oven and pour the boiling water in the skillet on the bottom rack. Quickly shut the door and let the dough rise in the cool oven for about 30 minutes or until double in size by the aid of the steam. Take the knots and the skillet out of the oven. In a small bowl, whisk together the yolk + cream and lightly brush over the knots, taking care not to let any of the egg mixture pool. Sprinkle with a tiny bit of the grated parmesan. Preheat your oven to 350 degrees F and bake the knots in the middle of the oven for 20-25 minutes or until lightly bronzed and an internal temperature reaches 190 degrees F. These are best served immediately. Thank you for making these beautiful mustard knots! Tag me on social @displacedhousewife #displacedhousewife so I can see them!!! Heat your oven to 350 degrees F and bake the knots in the middle of the oven for 20-25 minutes or until lightly bronzed and an internal temperature reaches 190 degrees F. These are best served immediately. 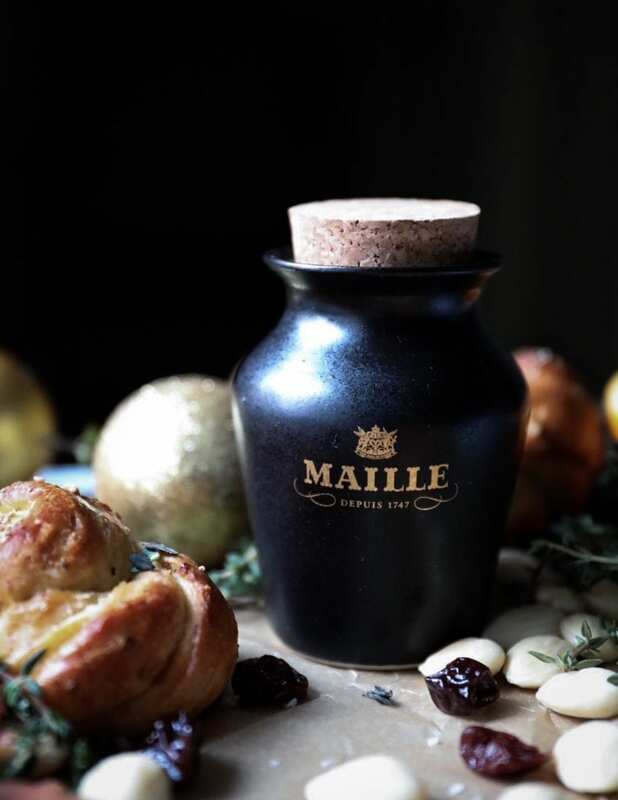 A huge thank you to Maille for sponsoring this post! All content, ideas and views are my own. 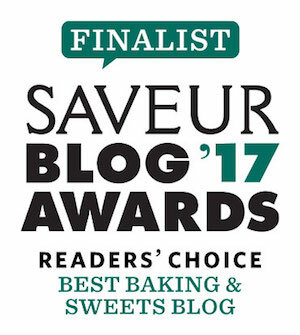 Thank you for supporting the brands that keep me in the kitchen! Holy cow. 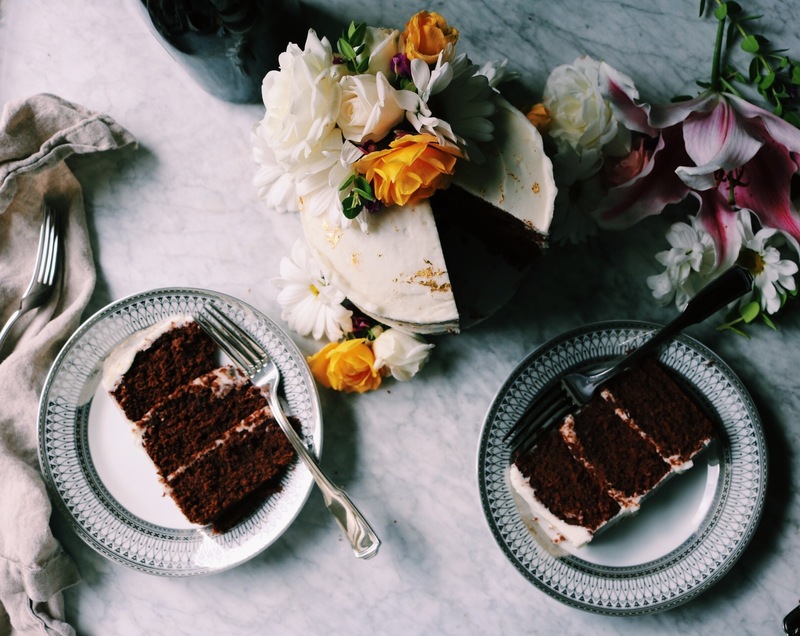 Would these be the ultimate Valentine’s splurge or what?! Okay so today I had these incredible dough bites with honey dijon and I NEED to recreate them. I think I’m going to start here. Off to the kitchen! Maille, Cara-Caras, prosciutto, cherries…must be my birthday! These look great! I have to say I love your homemade proofing technique with the boiling water! I usually turn the oven on for a bit but that is jut a dry heat, your method is perfect! 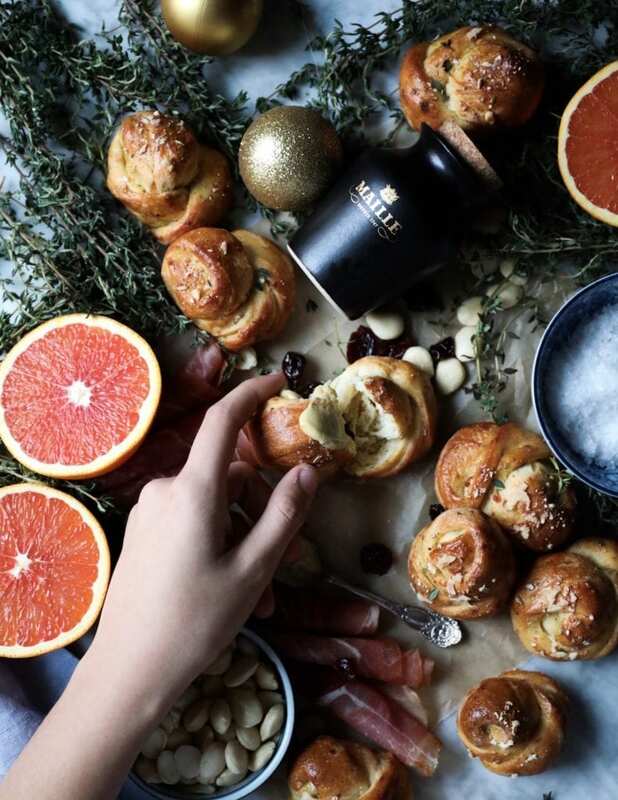 These knots look so delicious, perfect for the holiday season! I would devour all of these! They sound amazing!